Africans start shipping directly from Africa to other countries. Upon arrival, this begun the African slave trade that would last for many decades. Description: Slaves being captured by Portuguese to be shipped. During this time period, 12 million slaves were traded with 10-11 million surviving the trip. Most the the trade intensified after the 16th century. Portuguese missionary efforts to convert African kingdoms to Christianity. The missionary reached success in Kongo by converting the ruler Nzinga Mvemba and the entire kingdom into Christianity. 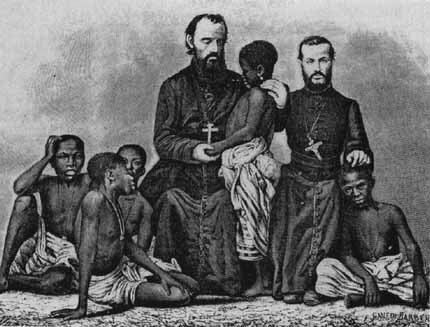 Description: Missionary efforts trying to convert African children to Christianity. Although Africans were viewed as slaves, the Portuguese came to admire the artwork created by them. 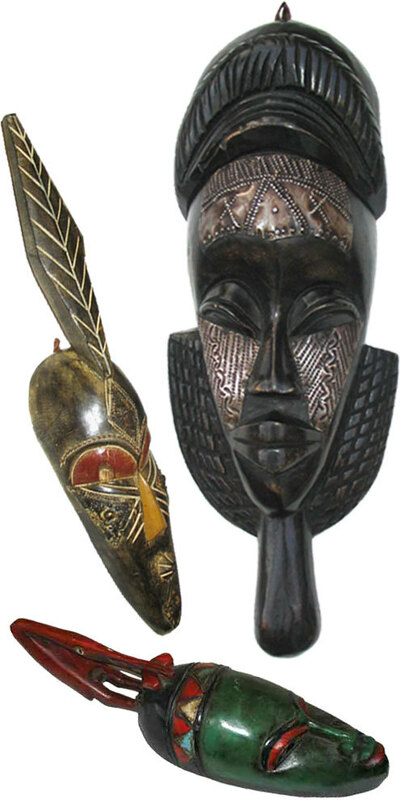 They hired artists from various regions from Benin, Sierra Leone, and Kongo. These objects of arts created by them ended up in collections of nobles and kings in Europe. In return for slaves, African states begin receiving rifles to agree with terms. Because of the artillery, African states were able to fend off neighboring enemies and maintain power and control. Beginning as early as 1508, slaves began to rebel against the treatment and labor they receive. 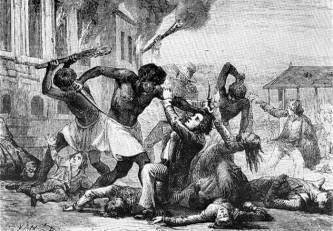 Africans ran away or plotted rebellions against their owners to escape the harsh conditions in which they lived. Description: Slaves who were tired of their work began to rebel against their owners. Portuguese begin establishing "licenses" and "asientos"
The licenses and asientos meant the state monopoly on the import of the Africans were passed to private hands. As plantations in the Americas, especially Brazil, began to grow and slaves were becoming necessary, slave trade grew popular. This caused other European countries to compete for control of the slave trade. Description: Europeans sailing to Africa in attempt to capture slaves for revenue. Luanda, being the basis for the first Portuguese colony in Angola, allowed the Portuguese to exert their power and show that they were going to stay. This motive was primarily commercial and military, although missionary efforts were on the side. Songhay was an empire which covered a large area of the western savanna. Despite its large size, Songhay was defeated by a Moroccan invasion which led to instability of the empire and eventually, its fall. Description: Despite covering a large amount of land, Songhay eventually fell due to invasion. In the early 16th century, in cities like Lima, Peru, African Americans outnumbered the number of Europeans. At this point, slaves worked all possible occupations which Europeans didn't want to perform. Description: As more Africans are shipped, the areas in which they are sent become African dominant in population. Around 1600, Sudanic states were introduced to Islamic concepts of slavery. Despite what Ahmad Baba said, Sudanic states enslaved their pagan and Muslim captives. In result of growing plantations in the Americas, slave trade became more popular and other European countries competed. The Dutch seized El Mina from the Portuguese and partly Angola to supply in north eastern Brazil. from the Oyoko clan, the Asante obtained firearms. They used these weapons to centralize and expand their empire. Due to the Dutch's success in gaining some control in Africa, they were able to create a colony to provide for slave trade for their country. Description: Dutch arriving at Cape of Good Hope to establish a colony. The English had growing colonies like Barbados, Jamaica, and Virginia which needed supplies of slaves to support the plantations there. For this reason, The English created the Royal African Company. 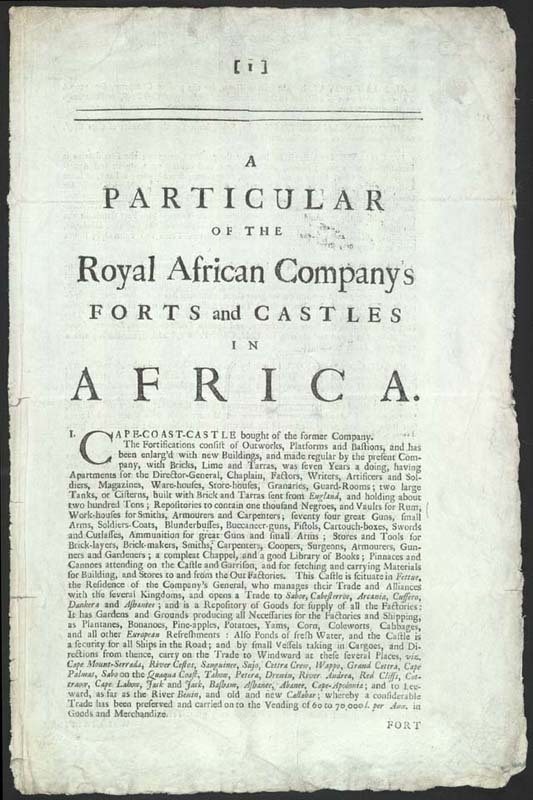 Description: Document of the Royal African Company granting a charter of monopolies of trade in West Africa. Osei Tutu created the title of "asantehene", which designated the religious and supreme civil leader. This role was the symbol of the Asante union as multiple Akan clans reported under the asantehene. The Dutch noticed this power change in political structure and decided to confront with it directly, causing the Asante empire to depend on slave trade for 2/3 of their economic state. At some points, there was a triangular trade which existed. Slaves were transported to the Americas, crops and goods to Europe, and Europeans went to Africa to start the triangle all over again. The kingdom of Dahomey seized the port of Whydah in 1727 and shifted towards the coast. This area had attracted many European traders. This kingdom increasingly became dependent on firearms and slaves and maintained an autonomy. During the mid-18th century, new intellectual movements formed which were against slavery. Philosopher Jean-Jacques Rousseau and political economist Adam Smith were both figures who opposed the brutality that came with slavery and the slave trade. Description: Many start to realize the cruelty of slavery and begin to fight to abolish it.